Zoom comes with a range of cloud video conferencing capabilities, including HD voice and video functionality, dual streams for dual screens, the ability to join as a view-only attendee, as well as by Zoom Rooms and telephone dial-in. It also has accessibility features, which allow employees who have disabilities to schedule, attend, and participate in Zoom meetings and webinars. The group collaboration features allow for simultaneous screen sharing, group messaging, whiteboarding, annotation and co-annotation, iOS mirroring on iPhone or iPad, and the ability to share documents, photos, and videos. Zoom includes unlimited VOIP with toll free options in more than 60 countries available. You can also integrate any third-party teleconferencing service. 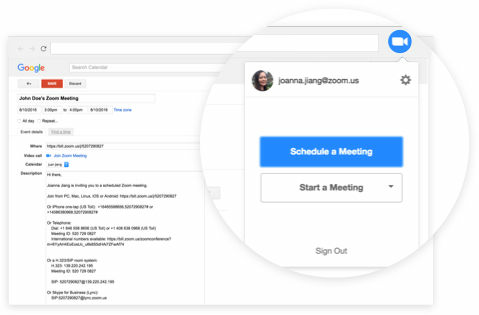 Zoom lets you create a personal meeting ID and URL name to share with participants when you schedule your meetings. The security features enable you to give role-based control and include SSL encryption plus HTTPS access. How much does Zoom cost ? The pricing for Zoom starts at $12.49 per month. 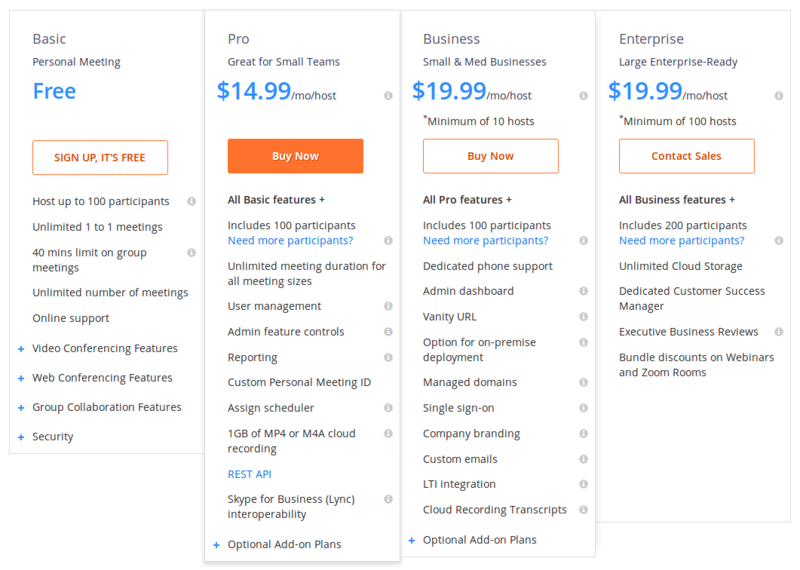 Zoom has 9 different plans such as - Pro at $12.49 per month, Video Webinar (Add-ons) at $33.33 per month, Additional Cloud Recording Storage (Add-ons) at $40.0 per month, Zoom Rooms (Add-ons) at $41.58 per month and H.323 Room Connector (Add-ons) at $41.58 per month. Large Meeting (Add-ons) at $50.0 per month, Audio Plan (Add-ons) at $100.0 per month, Education, Telehealth, Developers at $150.0 per month and Business at $166.58 per month. Zoom offers a Free Plan with limited features. They also offer an Enterprise Plan for their product. Note : For more than 100 Participants, Contact the vendor to get the detailed information. Based upon the Telephone Coverage and Rates, the pricing plan varies. Contact the vendor to get the latest pricing detail. 3. Developers : API commitment levels start at $100 per Month and offer per minute rates per attendee. 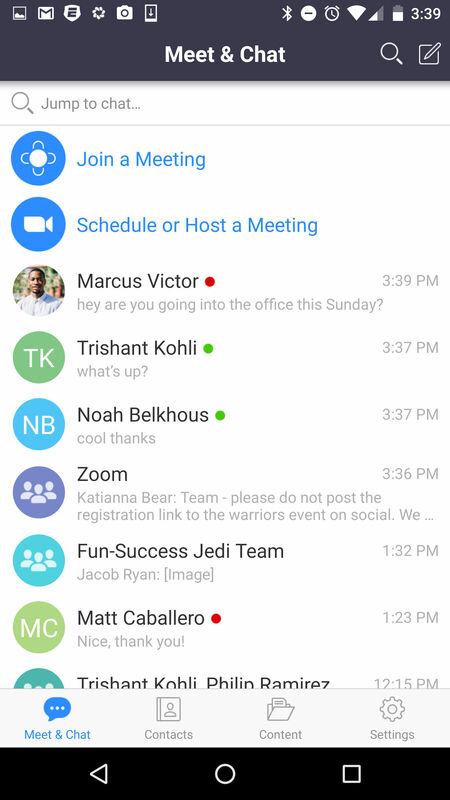 Overall: Zoom helped me to work remotely without facing any problems regarding to share screen or voice chat (that i faced when i used to use Hangouts, Skype), all the team can regroup together and talk like if we were in a real conference room. Pros: The video is very clear and sharing with others is very easy. I especially love sharing the screen with others. "Zoom - Everything you need in a Video Conferencing Tool & More"
Zoom does it all. Allows me to meet with clients virtually. We can talk face to face, screen-share, and I can even offer remote assistance if they allow me access to their screen. Zoom can be used on all operating systems (Mac & Windows), different devices (computers, tablets, smart phones, and even landlines). And it doesn't matter what browser you use... Chrome, Firefox, or Safari. 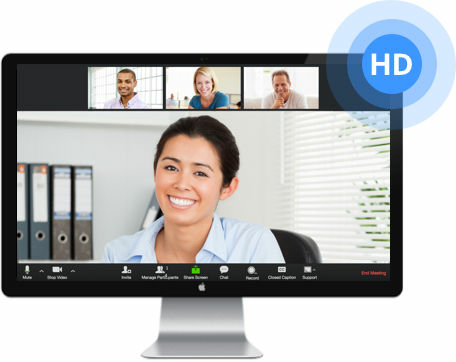 Best of all, you can record your video conferences. What a time saver. Sometimes first-time users get a little nervous about the initial download and one-time install. So it would be more helpful if my meeting attendees could just access straight from their browser. Take advantage of Zoom's free trial. Allows me to meet with my work team on a daily basis. Can meet with clients from all over the world. "A great experience with this easy to use Conference Tool"
Easy to install, easy to use and very easy to share with others. The free version is almost all we need at the daily job conference activities. Both versions desktop or web have good quality of video and sound e great options to manage the conferece. I had some webcam hardware incompatibility issues, i really do not know yet if it was a driver issue but i had faced the same problem at two differents machines. But it was already solved. 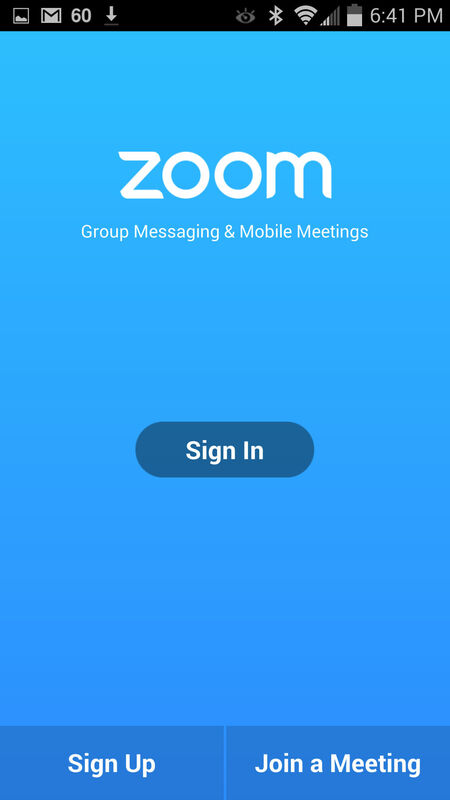 Business Conference with Zoom is considering increase your team's productivity. we use for business and for making brainstorm with teams of different locations. "outstanding - conference quality (Audio-Video)"
It was easy to access and the voice was clear never got hanged any single time. Conference calls, meetings, webinars, presentations, etc. It was a bit limiting to use and a little old looking the log in process can take awhile. 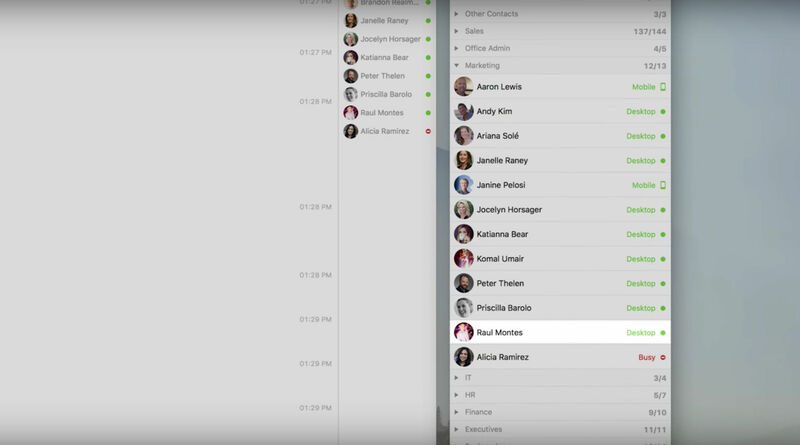 The newest iteration of Zoom has improved in both features and ease of use. At times, I prefer to use Zoom to calling for both internal and external situations. Of course, do whatever due diligence is your protocol. Then, and this is important...find live users of your competing products...not from the vendor lists, from Linkedin or other network contacts. Unbiased folks who are real-life users who work with the systems day-in, day-out. Those are the really important data points.
" Smart solution to make a conference from the cloud." As a coach my day to day conferences are what allows you to connect with people, having this service has allowed me to effectively organize them remotely with image and sound quality. The number of participants is quite limited per meeting in its free version, however it is worth investing in this service mainly for its quality. Although it is not as popular as others in your competition, it is a guarantee that you can continue to use this platform. "Great product that brings collaboration to the forefront." We switched from GoToMeeting a year ago and couldn't be happier. Honestly, it is a great product that seems to be less fluky than others we have used. The video conferencing is really solid and stable, with minimal lag. There isn't much to dislike. We have been very happy with it overall. The admin console is a little confusing, butnot crazy. Go for it - we don't use their webinar functionality but definitely like it for remote meetings. We use it for client demos but we also use it to bring in our remote employees for company meetings.